Named a top 10 wine bar in the U.S. by both Gayot and Fox News, Patrick’s Bar Vin is a New Orleans wine bar in the heart of the French Quarter, managed by New Orleans’ own bon vivant, Patrick Van Hoorebeek. Step inside the private courtyard and you’ll discover an elegant gathering place full of locals, perhaps a few Krewe of Cork members, and wine enthusiasts from around the world. Rich hues and personal touches by Patrick reflect the warm and relaxed atmosphere. An limited number of personalized, climate-controlled wine lockers are available for annual ownership. In addition to offering an extensive wine menu, patrons will find a fine selection of beers from Patrick’s native country of Belgium as well as a host of signature cocktails. The original Manneken Pis is a small bronze sculpture of a naked boy urinating into a fountain’s basin in the city of Brussels, Belgium. The statue dates back to the 17th century and there are several legends of its origin. Today, the statue can be seen frequently in different costumes. 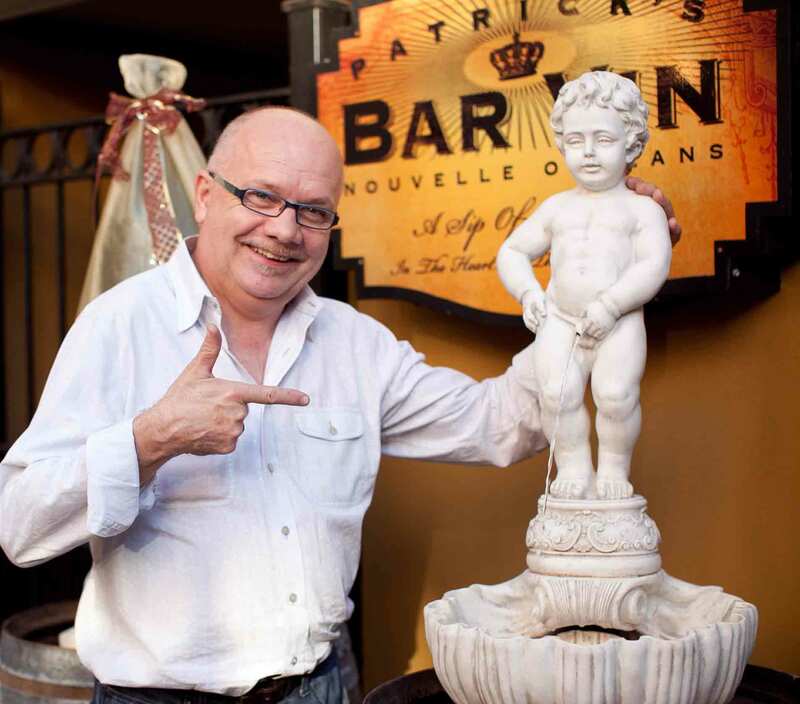 In honor of his Belgian heritage, Patrick has a Manneken Pis fountain that is lovingly called PP Boy. PP Boy’s can almost always be seen in a season appropriate costume.